It's Monday and time for another Bitten By The Bug 2 Design Team Challenge. Today Shelly picked our challenge. 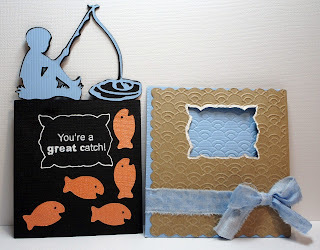 She chose the boy fishing on the A Child's Year Cricut Cartridge. I decided to keep this one simple. I love the cuts on this cartridge--they are so simple but look so detailed at the same time, if that even makes sence, LOL! I welded the boy fishing from A Child's Year @ 2.88" with a rectangle from George and Basic Shapes at 3.75" on my Gypsy. This would serve as the pullout part of the card. I then cut a card base from A Child's Year from Kraft @ 4.43--large enough for my pullout to fit into. I added a piece of blue paper embossed with the Japanese Scales Cuttlebug folder and sealed the card leaving the top open. Fish were cut from Create A Critter at 1.08" and added to the pullout. The sentiment is from My Pink Stamper Even More Punny-Licious Stamp Set. I added a little white gel pen around the sentiment cut out to make it stand out. This was a fun challenge! Now please go over to Bitten By The Bug 2 and see all the creative ways this cut was used. You can even play along with us! Tomorrow I will be back with our monthly My Pink Stamper Design Team Post. Oh Maria I just Love it! 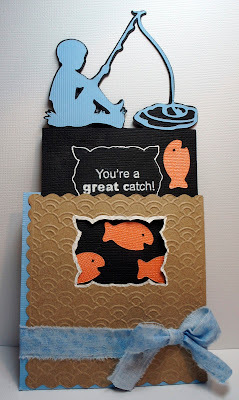 What a great idea to do a slide out card. How am I going to try all these wonderful ideas and still find time to sleep and work, lol! Heck I have a hard enough time with the weekly challenge lately, hee hee! OMG Maria--this is so incredible. What an over the top design. Well done, Sweetie! Simply amazing from the design to the bow. A great take on the challenge. Love the slide out card idea. Very pretty and I love the pull out portion. Beautiful as always Maria! OMGoodness! This is incredible! I love how you welded the boy to a rectangle for a pull out card. The little fish are so cute, too! 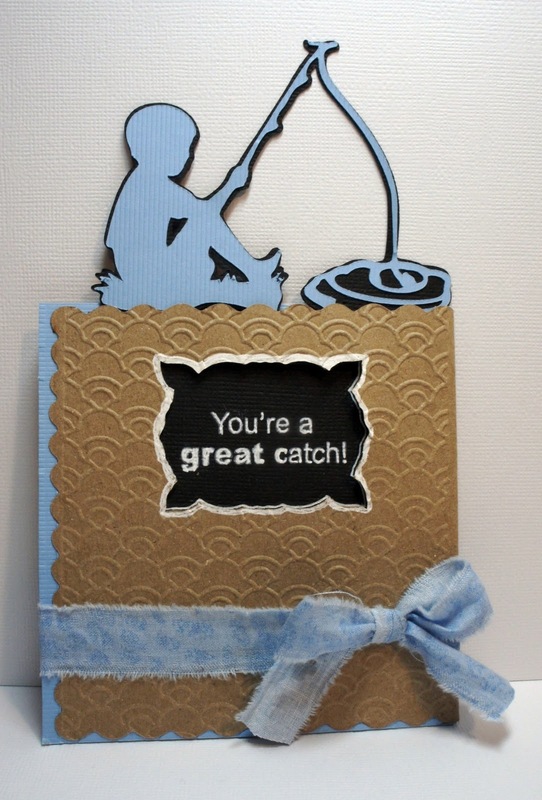 Such a cute card, love the pull out design!